The Sklz Gold Flex Strength and Tempo Trainer will train your core golf muscles as well as smooth out yur tempo. * Flexible shaft and head weight synchronizes arms and body to develop a smooth and natural tempo. If you have any questions regarding the Sklz Gold Flex Golf Swing Trainer, please give us a call, we would be happy to help you with any questions you may have. 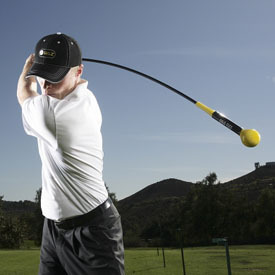 Write an online review on the Sklz Gold Flex Golf Swing Trainer, and share your thoughts with others.